The Rt. Hon. 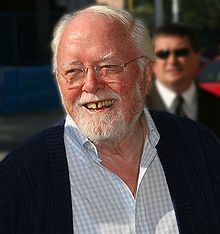 Richard Attenborough, Baron Attenborough, CBE (29 August 1923 – 24 August 2014) was an English movie producer, director and actor. He was born in Cambridge, England. Attenborough left his home when he was 17 to attend the Royal Academy of Dramatic Arts in London. He earned his first West End theatre role, then went to national stardom in the play Brighton Rock. Attenborough later became a producer and director. He produced and directed the movie Gandhi. Attenborough said that the movie Gandhi was his dream project and waited years to make it. Gandhi won 5 British Academy Awards and 8 American Oscars. In 1983 he won the BAFTA Academy Fellowship Award, a lifetime achievement award. In his movie roles, he is mostly known for his roles in The Great Escape and in Jurassic Park. He was the older brother of naturalist David Attenborough. Attenborough died on 24 August 2014 at the age of 90 in London after years of poor health. This page was last changed on 28 January 2019, at 06:12.